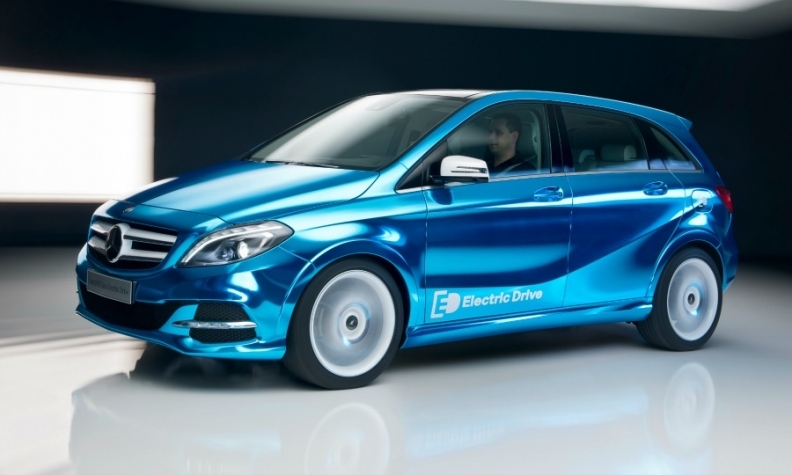 Mercedes's electric B class has a range of about 200 km (124 miles). GENEVA -- Electric vehicles likely will need a range of at least 499 km (310 miles) per charge to become a mainstream option to internal combustion powered cars, Daimler CEO Dieter Zetsche says. That range is "probably a reasonable number to pursue," Zetsche said last week at the Geneva auto show. But he said there are no magic numbers to trigger broad consumer acceptance of EVs. "I don't know if there's one tipping point after which in two years all internal combustion engines will be replaced in new-car sales by electric cars," Zetsche said at a roundtable with U.S. media. Instead, he described a "continuum" of necessary steps. One of those steps: Battery cost must fall for EVs to reach prices that will prompt consumers to swap standard vehicles for electrics. The cost of batteries is around 155 euros ($170) per kilowatt-hour, Zetsche estimated. Hitting 100 to 119 euros ($110 to $130) per kwh is "perhaps the threshold where performance wise and cost wise you start to become competitive," he said. When Chevrolet's all-electric Bolt goes on sale late this year, it will be among the cheapest per-kwh vehicles on the market, according to General Motors. The Bolt will have a range of just over 322km (200 miles) on a single charge. The Bolt's LG Chem-sourced batteries cost $145 per kwh, GM said, helping the automaker to keep the Bolt's price at $37,500, including shipping but before tax credits. Pulling EVs out of the niche market also means further developing EV infrastructure, Zetsche said. The expanding range of plug-in hybrid vehicles will also be a step toward widespread EV adoption, he said. Daimler's Mercedes-Benz has been bullish on plug-in hybrids.